Saturday was an evening full of close games and exciting finishes across the Twins’ minor league system. Brent Rooker starred for the Lookouts, hitting a walk-off double, and DaShawn Keirsey led an impressive comeback win in extras for the E-Twins. Come read about what else happened, including an explanation behind why Byron Buxton had to swap to an infielder’s glove at the end of the Red Wings’ game. Chris Paul was placed on the DL with a finger sprain and Jordan Gore was promoted up from Cedar Rapids to replace him on the Chattanooga roster. Ariel Montesino was moved up from Elizabethton to take Gore’s spot on the Kernels. New acquisition Jon Kemmer was activated by the Red Wings and Chris Carter was released. Byron Buxton ended this game playing in the infield. The Iron Pigs had the bases loaded with nobody out, so the Red Wings put on an extreme shift with five infielders and two outfielders. Unfortunately, the batter sent a fly ball to the outfield that ended up being plenty deep enough to score the winning run on a sac fly. This game probably wouldn’t have gotten that far if Nick Gordon hadn’t have made an excellent play to end the 10th. Lehigh Valley had runners at first and second with no outs. The batter sent a bullet of a line drive to Gordon’s right, but he snared it and threw to second to double off the runner and end the threat. Buxton oped this game with a walk, stole second base, advanced to third on a Gordon groundout and scored on a Gregorio Petit single. In the sixth, Kennys Vargas hit a two-run home run. Zack Littell has had a rough go of it in his two appearances with the Twins, but he’s been great with Rochester. He’s now surrendered just 18 earned runs in 57 innings (2.84 ERA) to go with 52 strikeouts (8.2 K/9). This game was knotted at 2-2 entering the bottom of the ninth. Luis Arraez hit a one-out single and then scored all the way from first base on a walk-off double from Brent Rooker. Chattanooga fell behind 2-0 in this one but Ryan Walker hit a huge two-out, two-run single in the sixth to tie it up. 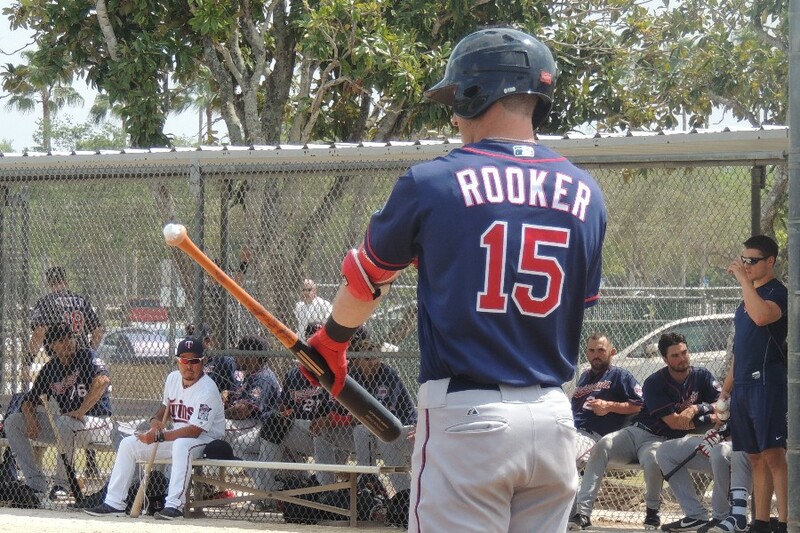 Rooker entered this game second in the Southern League with 22 doubles and he added two more tonight. Brian Navaretto was 3-for-4 with a double of his own. Navarreto’s 13 two-baggers on the year look pedestrian next to Rooker’s impressive total, but that ties his career high for the Lookouts catcher. Lewis Thorpe struck out eight batters, but he was already at 97 pitches when he left the game after 4 2/3 innings. Ryan Eades followed with three shutout innings before Tyler Jay recorded the final four outs to earn the victory. Shane Carrier hit a home run for the Miracle in the third inning. It was particularly noteworthy because that was Fort Myers’ only hit of the night. Griffin Jax tied a career high with seven strikeouts and threw 69.2 percent of his pitches for strikes. Jax was recently named the No. 26 Twins prospect on Twins Daily’s midseason Top 40. The Cougars held a 1-0 advantage until Cedar Rapids finally broke through in the seventh. The inning started with consecutive hits from Andrew Bechtold, David Banuelos and Trey Cabbage, and was highlighted by a two-run triple from Jean Carlos Arias. Jordan Balazovic gave up just one run on three hits over his 6 1/3 innings of work. He struck out five batters and only needed 84 pitches to get that deep into the game. Jovani Moran handled the final 2 2/3 innings and got strikeouts on five of the nine batters he faced. Moran, 21, has been dominant for Cedar Rapids, racking up 70 Ks in 44 1/3 innings (14.2 K/9). Jacob Pearson had another impressive night, going 2-for-4 with a double and a walk. This one went into extras and E-Town gave up the go-ahead run in the top of the inning. In the bottom of the 10th, DaShawn Keirsey hit a game-tying RBI double with one out. He eventually advanced to third on a passed ball and then scored the walk-off run on a ball that was hit back to the pitcher. It was officially scored as a fielder’s choice, missed catch error on the pitcher. Keirsey had a great game, going 3-for-5 with his first professional stolen base. Fellow 2018 draftee Chris Williams hit his sixth home run already in what was just his 16th game with Elizabethton. Just to give that some perspective, last season Brent Rooker hit his sixth homer for E-Town in his 17th game. Ryan Jeffers only got one stinking hit, dropping his average to .386. What gives? The Twins jumped out to a 5-0 lead in this one with the big hit being a two-run double from Yeison Perez, who was 3-for-5 with a pair of doubles and four RBIs. Good to see Tyler Jay with a clean inning and a fraction and a K to boot. Also, cut Ryan Jeffers already.Average down to .386.What a bum. Weird how Littell pitches so well at AAA but he looks like he was promoted from A ball when he came up both times for the Twins. I'm not sure if I want to see him again this season, but maybe he'll look better in September. If not, I'm looking forward to him as a potential starter in 2019, but he's unlikely to be given a spot in the rotation right off the bat. We talk a lot about promotion time. I think he got his first shot a bit early. His second shot was a bit of mess, coming out of the pen. Plus the initial confusion he was comjng out of the game vs defensive realignment. I think he could be OK, but was rushed some. Why was Carter cut and what does Kemmerbring.Minor league stats has Carter with 20 HR, 224/317/519-Kemmer 13 HR 253/334/476.Neither are exciting, but I am still trying to understand this FO reasoning.Since they acquired him I am sure we will see kemmer in Mpls. Littell and his contrast from MiLB to MLB raises the old question about how the Twins prepare and handle players promotions. Worth noting that Littell's K/9 at AAA is actually slightly below league average (8.3). Since he's only been around for less than a year, it's easy to forget how young Littell is and how hard the Twins have pushed him. Littell started last season in High A, entered this year with only 14 starts above that level and is still only 22-years-old. He's younger than all of the following pitching prospects: Stephen Gonsalves, Fernando Romero, Kohl Stewart, Griffin Jax, Tyler Wells and Charlie Barnes. Littell is the eighth-youngest player to appear in the American League this season. But I still agree with your main point. I'd rather see Romero or Mejia back or Gonsalves get a crack before Littell is brought back up to the Twins. He's not quite ready for that. Carter's PCL numbers were amazing (.933 OPS) but he's been pedestrian since coming over to the Red Wings (.721 OPS). The Twins are going to start looking toward 2019 and Carter is 31-years-old. Not a lot of reason to keep him around. On the other hand, it's also pretty strange that the Twins would acquire another left-handed bat in Kemmer, but at least he brings some positional flexibility over Carter, though both have primarily DHed this season. Maybe Carter asked for his release or had become bitter about not getting a callup, who knows? Or maybe this has less to do about these two guys and more to do with making room for somebody who'll be promoted in the coming weeks (Rooker, Sano?). I'd be surprised to see Kremmer make it up to the Twins. This same front office acquired Carter too, and he never got a look. Carter-Vargas We only needed one and Vargas has been hot as of late.Kemmer has strong Minor League stats and Carter's good stats came the first half of the year and he's hitting .187 with Rochester in 123 AB's.Also, Carter was DH only.As far as Littell goes.I'm glad he's seen the Bigs, but that last call up made me scratch my head, he's not a relief pitcher.Littell is the youngest pitcher on the AAA team and I think he's another Slegers.I like him, but it might take a while to find his legs at the Major League Level.I think next year (mid season) he'll be ready for the jump, but he still need some Sept starts. Also worth noting that the league average is inflated somewhat by relievers and that Littell's K/9 ranks 22nd among the 61 IL pitchers with at least 50 innings this season. what does the FO. do with Rooker?Do they bump him to AAA.Do they add him to the 40 man roster so he can get a Sept Call up?I think this FO moves player to the Bigs at a slower pace then the last FO.I think they'll let him finish out the season at AA and Move him to AAA next year.But, it might depend on Morrison and what happens by trade deadline.Will we move any Field players and are we losing. .
Really excited about these young players coming up. I hear we have a young buck in Rochester who can really run it down in CF, and a monster A-baller who hits it a mile and can spell Escobar at 3B. C'mon, there are a dozen other guys you can spend your energy on just from last night's games if those two individuals have you frustrated. And those big AAA reliever K rates already seem to translate pretty poorly to MLB, if the Twins system is any indication. Didn't mean to pick on you or Littell, just throwing a note of caution there, as folks often see that K rate and get overly impressed, as it would have been well above league average a few years ago. I am frustrated, but still a big Littell believer.From what little I have seen I love the way he bends his pitches.If he can get that fastball to play up a bit more I have to believe he is a serious number 3. He has the secondaries to make it so I can see why the Twins brought him up over others.He seems to be on the Berrios track right now.Struggling to find that mix and refinement to get big league hitters out.Hopefully it won't take him as long to figure it out but IMO he has the stuff to make it and stick. Was really looking forward to last night when I saw that Thorpe-Jax-Balazovic were all starting.They sure came through with 20 strikeouts (8-7-5) with only 2 walks (0-0-2).Thorpe had a short start (4.2 ip), but that happens to him fairly often as a result of a high number of strikeouts.Really like seeing Jax with a quality start and Balazovic just seems to be someone we really have to keep our eyes on. Like seeing Arraez get some hits while he settles in to AA.And if Rooker keeps this up he is going to force the Twins to do something.And who is this Williams guy?Isn't he the guy they signed way under slot for $10,000?Also curious why Keirsey, who is hitting .340, has been in the bottom third of the order? Any chance that Vargas gets another shot on the major league team this year? What is everyone’s thoughts on Navarretto? My understanding was always that he had a very strong arm and was a plus defensive catcher. Seems like he is figuring out how to hit a little bit. Could he become a number 2 catcher in the mlb? That was actually my first thought when I saw Carter was released, except I only thought Rooker. Get him to AAA this year. As much as I’d like to see him all the way up, I don’t think that happens this year for a number of reasons. But I think they could and should push him to AAA this year. At least we know Buxton's got the speed to stick at short. Who will the Twins drop, release, demote...when Buck returns to the team? Also interesting is that Littell has been traded twice already, first by the Mariners for a reliever, next by the Yankees for 2 months of Jaime Garcia. So despite his size/age/stats, maybe he's still seen as a bit of an underdog, stuff-wise? And I posted this elsewhere, but maybe this isn't the right organization for Littell to get an opportunity. We tried to jump-start him with call-ups already, but looking at our roster, he may only be 8th or 9th on our SP depth chart for 2018-2019.